If your home or business suffers water, fire, smoke, or mold damage, it can be a very traumatizing time in your life. Working through the emotional loss and dealing with the property loss on top of filing insurance claims leaves you little time to clean your personal belongings. How to clean them properly may also have your mind boggled. This is when you need a professional cleaning company to help you. At Rainbow International Restoration, we’ve got you covered. We sympathize with what you are experiencing on a personal level as well as a professional level. Our service professionals ensure your personal belongings receive the best possible care by meticulously documenting each and every item including photo documentation, identification numbers and detailed lists. Using Assured PackOut software in our inventory process, we are able to provide precise tracking of your items. All of your personal belongings are carefully and respectfully packed to be transferred to an off-site facility to be professionally cleaned and restored, if possible. At the off-site Rainbow International Restoration facility, your items are stored in a secure, climate-controlled environment where they will remain until the professional cleaning and restoration process of your home or business has been completed. Successfully restoring personal belongings can help ensure significant cost-savings over item replacement as well as avoiding the loss of items no amount of money can replace. Using industry-leading technology, equipment, processes, and training, we guarantee your valuables are handled in the most responsible and professional manner possible. When the professional cleaning and restoration process of your personal belongings is complete, they are returned to you in the exact same manner they were taken. 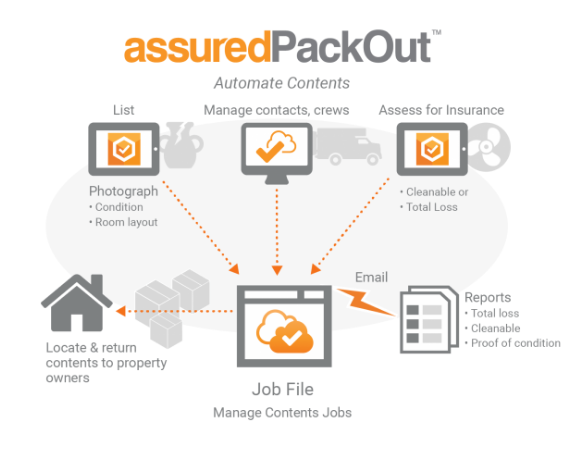 Using the same inventory procedures and documentation used in the pack-out process, your personal content is loaded, transported, and delivered back to you with extreme care. It is then reconciled with the original pack-out inventories. By using these industry-leading processes, procedures, and technologies, we provide complete professional cleaning and restoration of your contents as well as your structure. Call Rainbow International Restoration at 877-853-2445 immediately if you are the unfortunate victim of a house or business fire, smoke damage, water damage, or mold damage. Our service professionals are available 24/7 to help you.